When we moved aboard well over a year ago we decided not to get a storage unit. I was good with that, but what to do with all of the stuff that didn’t really belong stowed on the boat but might handy to complete something on the to-do list before we departed? Shoved into my SUV, that’s what. I filled it to the roof with things I just couldn’t part with, but knew had no place on board. Literally to the roof, I don’t know how I haven’t run someone over backing up and I certainly haven’t gone through a single drive-thru without feeling the judgment of being a full-blown hoarder these last months. The contents are mostly “supplies” for projects and the thought was they would get consumed as the to-do list dwindled. 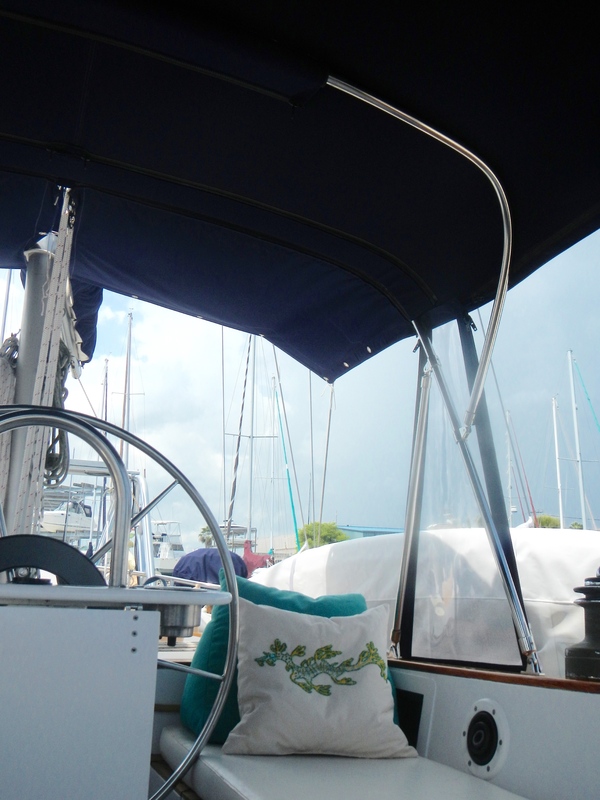 Among my hoard of supplies I was lugging around several random pieces of teak; the old dodger, bimini, and sailcovers; a bag of styrofoam beans for the beanbags; and lots of odd pieces of foam, batting, and fabric scraps. Not much has gotten consumed and my car still only had room for only me-no passengers. With the fact that we are quickly approaching the day where I need to sell my car I had to get busy clearing it out one way or another so I started recycling, reusing, and eventually reducing the hoard in my car. 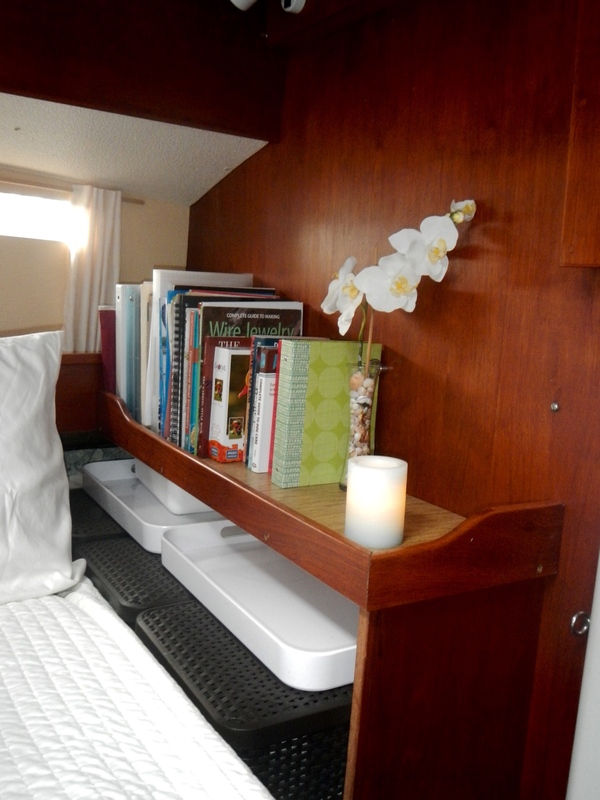 First project was to use some of the teak and build a book shelf in the aft cabin. Oddly, we didn’t have a single shelf in the boat that would hold a full size reference book or guide book and I thought it was finally time to remedy that. The finishing work is still in progress, but the books are on. I think it’s pretty good for only using recycled wood. A rope cleated to the bulkhead will keep things in place. 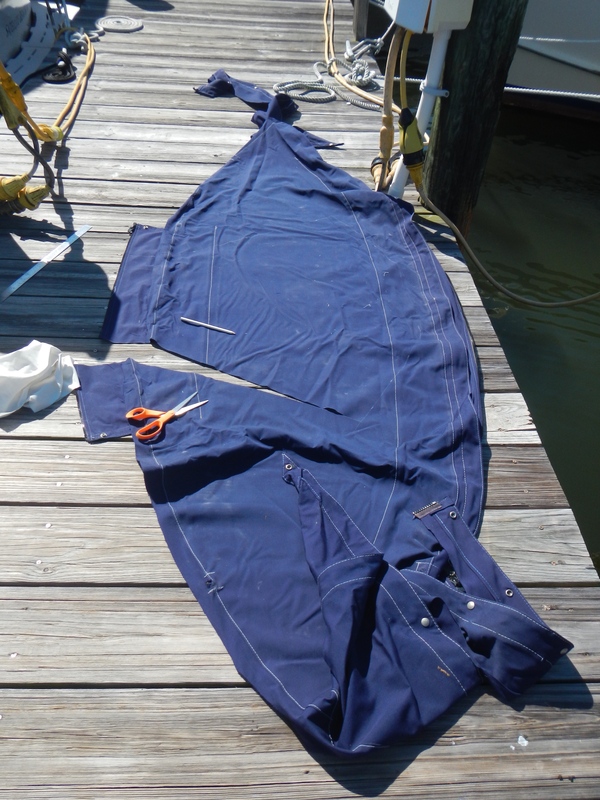 Next was to salvage as much canvas as possible from the old dodger and bimini. 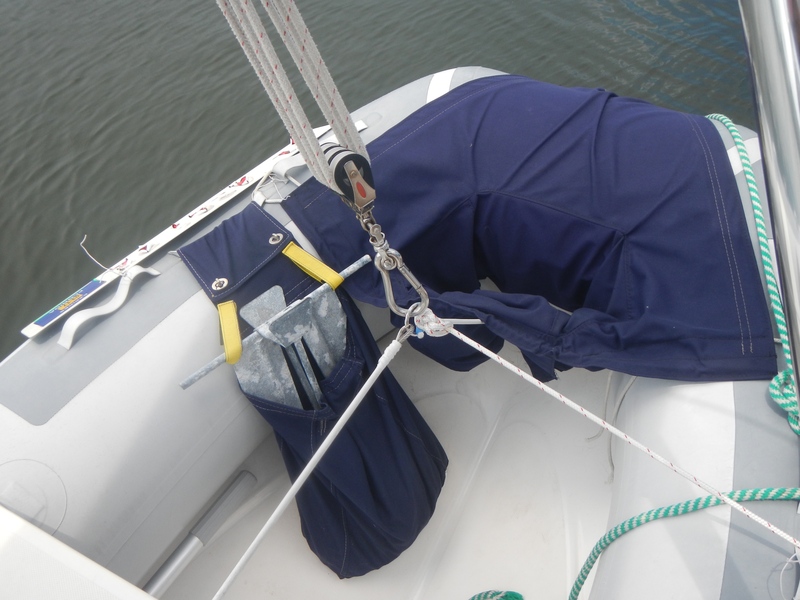 I made two storage bags for the dinghy, one is for the anchor and line and the other is for our snorkle gear. 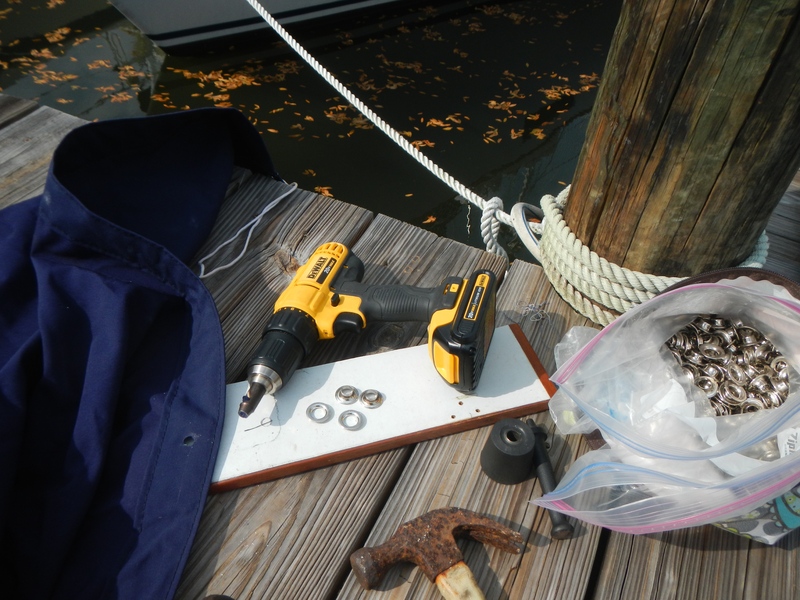 They snap on to the handles and keep the dinghy floor uncluttered yet remove easily. I think they are going to work well, but didn’t put too much effort into the craftsmanship as I am considering them my prototypes. I’m sure the second generation might have some modifications. With plenty of old Sunbrella left I moved out of the dinghy and up to the mother boat and made what I think will be a great add-on to the bimini/enclosure setup in place. The bimini ends just before the cockpit does due to the main sheet so when it rains the cockpit (and cushions) get very soaked if the enclosure panels aren’t in place which they frequently aren’t in place because it makes the cockpit a steamy greenhouse when all closed up. To keep the cockpit drier and shadier I made two little pieces that zip right onto the bimini with grommets on the back. Super simple, yet very effective. 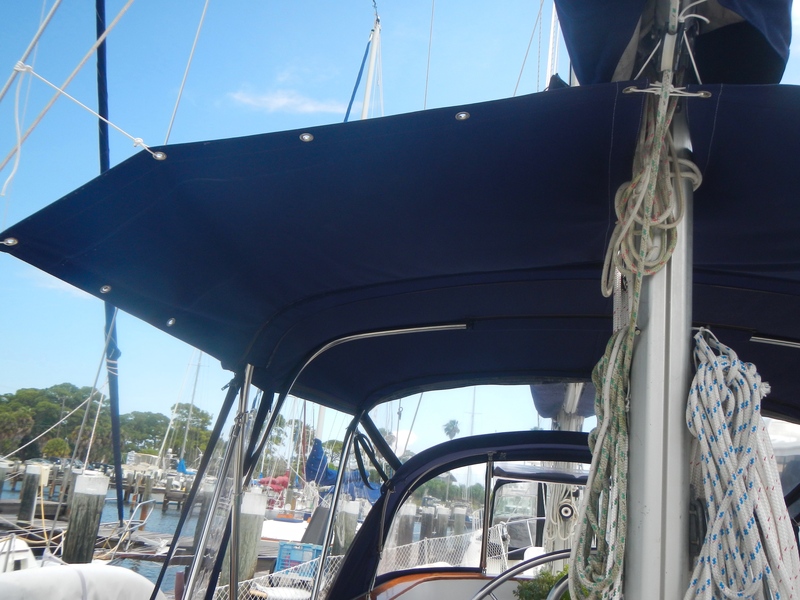 I like how well they follow the curvature of the bimini on the grommet side. Yeah for shade! I’m liking these recycling (completely free) projects! The bag ‘o beans was used to make Kai a bean bag bed and our cockpit bean bag wedges were fluffed up. 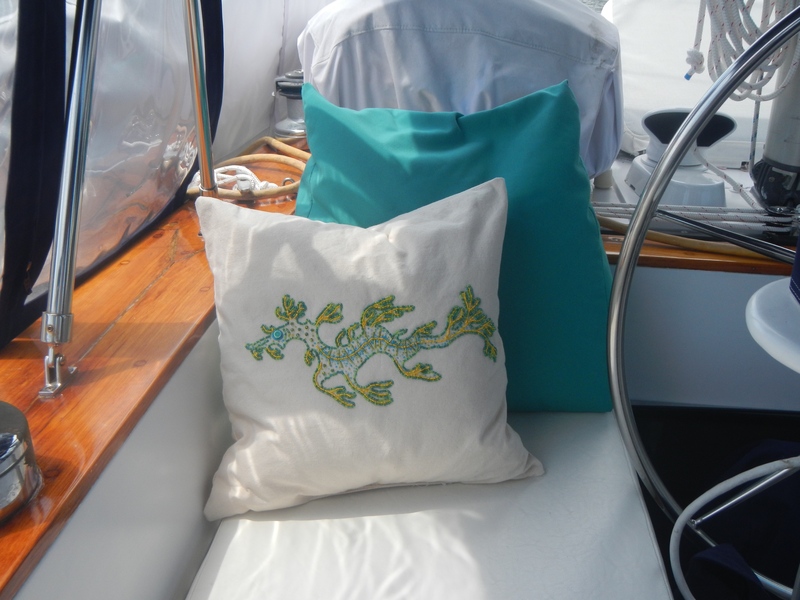 I even filled up one of my handmade bead embroidered pillow covers for some outdoor-friendly whimsy in the cockpit. (It’s a leafy seadragon-it’s hard to tell in the photo). With those complete, I had one more bulky item out of the car, I can almost see the backseat now. I used up some small scraps of fabric to make a canvas water bucket. Canvas water buckets come in handy when you have to rinse the deck off due to a little pup having been trained that it is OK to do his business there. Our last one wore out. I added a tag with glass marbles on one side of the bucket so that it tips and fills with water easily. ← Hello, Ball Bearings. Welcome Aboard!